Rev. 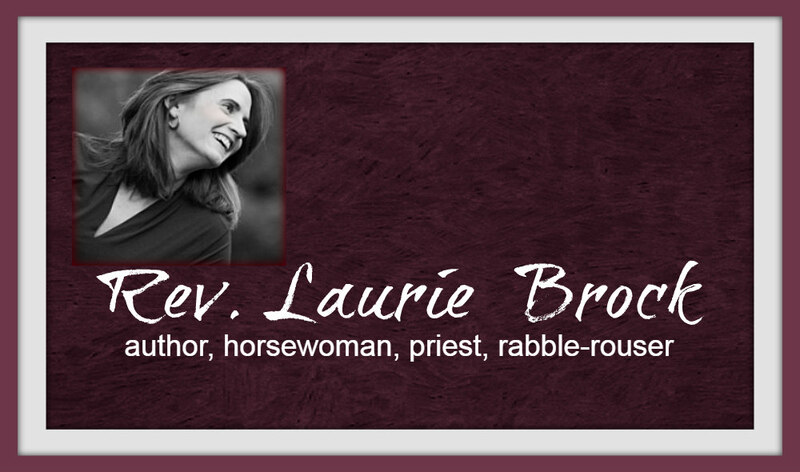 Laurie Brock: What Do You Do? We get this, we priest and pastor types. "So, what do you do?" At dinner parties, at bars, at the grocery store, even at church. "What do you do? ", which may encompass everything from a random line at the local watering hole from a guy who wears his jeans very well to a parishioner generally interested in what you do the rest of the week she doesn't see you in church saying prayers on Sunday. Now, you can be very holy and righteous, and explain with great reverence the detail of what we clergy actually do during the week: pray, listen, read the Bible, read other scholarly material, gather with other clergy and pray some more, be prayerfully present with people, and practice discernment. Or you could have fun, wink at God just a bit, and enjoy the fruits of imagination and laughter. I am a holistic listener. I have no real idea what this means, but doesn't it sound impressive? You can get a certificate in holistic listening from some Tony Robbins guru-institute, I'm sure, where you gather with others and increase your emotional intelligence while becoming change agents for integrity in the wider community. Or create your own definition by simply stringing together any series of impressive sounding yet nebulous words. Make sure you include key phrases like self-realization, learning environment, and intentional focus. I am a hostage negotiator. Any clergy person worth his or her salt has ended up in said position, be it the dispute between the Altar Guild and the Choir, the bishop and the vestry, or some other situation in which both parties are holding guns at each other while you attempt to figure out what will solve this dilemma with little or no help from either party. One side wants the church to be painted purple; the other wants the roof to be glass. You've got twenty minutes before hymnals are thrown. Go. I work as a general contractor. No, I'm not licensed, but people seem to think I am capable of dealing with the air conditioner that isn't working and the faucet in the sacristy that won't turn off. And, for some reason, I go flip switches and turn knobs like I have any idea what I'm doing. Then, when there's an explosion, I call in the real professionals and hope no one was seriously injured by the fireball. I work for a non-profit.What kind? One that doesn't make a profit and serves human needs. This is my preferred one for the guy who wears his jeans well. That answer suffices until at least the second date. I hang out. Yep, I spend a great deal of time hanging out with people, getting to know them, sharing about our journeys. I do that, because relationships matter, especially in a culture where far too many people feel out of touch or ignored or devalued. I wish the best of my job sounded more impressive, but there you go. I hang out, drink coffee or soda or wine, and build friendships so that when God tells us there's work to do, we're ready. Oh, and I'm also a certified holistic listener with a degree from a college accredited in Guam and some of the contiguous United States, depending on how the attorneys general apply the regulation. For a while I had "non-profit leader" on my eharmony profile as my occupation. Seeing the above, for the response to the guy in the well-fitting jeans, I'm oh-so-pleased with my wisdom! I work for a non-profit that focuses on inter-generational community building activities. We meet about once a week, and almost every town has one. On top of all those things I will add "I am a project manager" (who hates project managing, BTW). Usually I just respond with "Episcopal priest" to which anyone who has been around me for 5 minutes says, "You don't seem like a religious person" which I wear as a badge of honor. I always get this question when I'm having my hair cut - and to save my self from the sort of hair style they THINK sums up 'woman priest' I say "I work from home". When the hair is looking reasonably funky I'm happy to elaborate and come clean! I say public relations or messenger service. It worked to get the third date, and throws people off while on vacation. I know a priest with a PhD that says doctor. When asked his specialty, "Urology". I have been looking for this site (well, not this site specifically, but folks who are clergy and ir-reverent.) Finally, here it is. This is really laugh out loud funny (the 'hostage negotiator' is genius.) I reposted some stuff onto my Facebook page as soon as I read it.